I used to work with a complete germaphobe. I mean, this guy would carry a bottle of hand sanitizer from his belt loop with a carabiner. No joke. He would constantly point out things at meetings and gatherings that he thought were reprehensible and unsanitary, and sometimes he had a point. A few people grabbing chips from the same bowl, picking up ice, or inadvertently touching half the flatware in a cup while getting what they needed would make him cringe and complain for days. Growing up, I saw my parents plan carefully for dinners and gatherings to help ensure food and utensils remained ‘uncontaminated,’ and I have a minor in hospitality and tourism management (with one class, in particular, that stressed food safety and made us get our ServSafe certification), so all these experiences led me to think carefully about how to set up the buffet at our self-catered wedding reception. One of the things I absolutely knew I needed to avoid was sticking forks and knives in a communal jar, and I also knew loose napkins would fly away in the breeze. Making up these silverware packets ahead of time solved both problems for me! 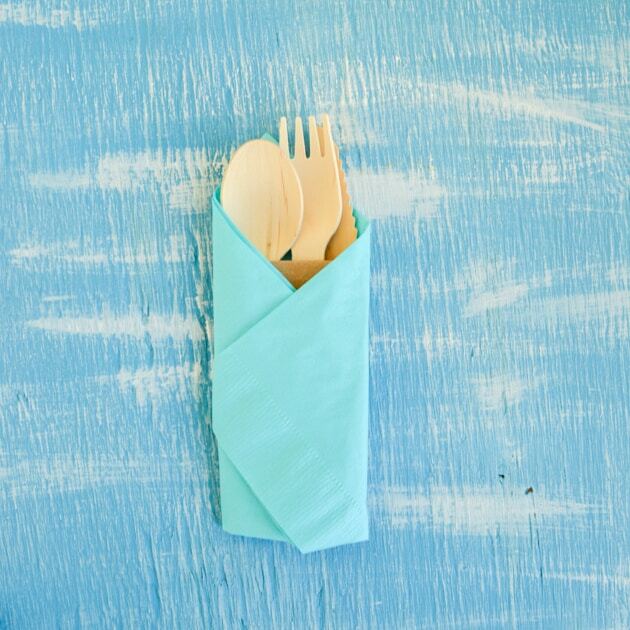 The flatware was neatly, cleanly contained and easy for people to pick up without stalling the food line, and the napkins avoided being blown all over the ground. Although making up 50+ of these packets seemed like a daunting task, I realized it was easy to streamline the process and was able to knock them out pretty quickly. The leftovers are working hard, too – I’ve been putting them in with Papi Chulo’s lunch so he can have chocolate pudding! 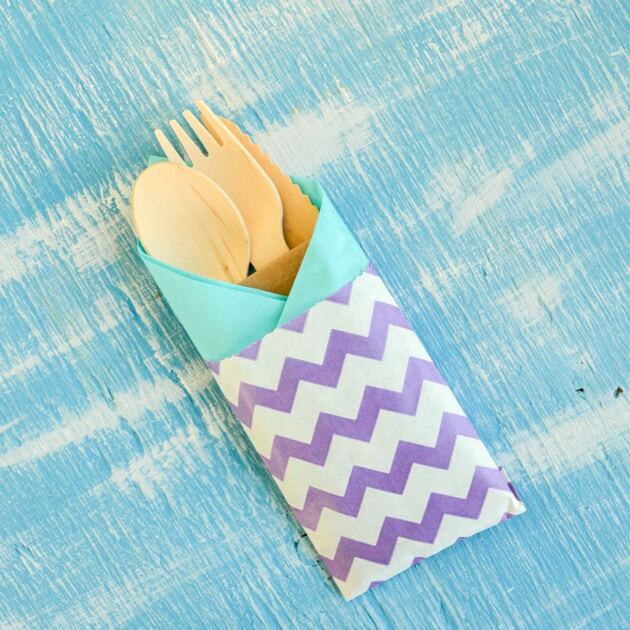 These silverware packets are ideal for a DIY reception, backyard party, a picnic, or even just a regular weekday lunch. I hope you enjoy the idea and can put it to use! This is obviously a pretty easy project, but I tried several different variations before I found ‘the best’ way to put these packets together effectively. The way outlined below yields the nicest-looking results that are easiest to assemble! 1. 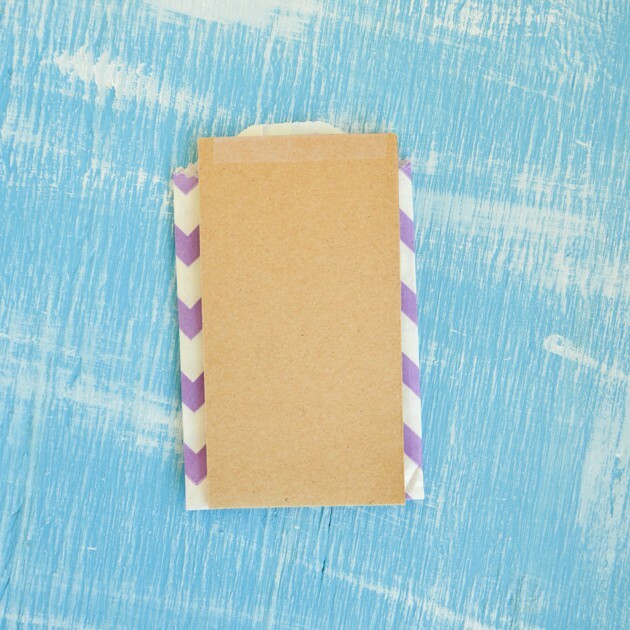 Create a folding template by cutting your cardstock down to size. Make the template about 1/4″ narrower than your bags and tall enough to stick out of the bag a little if inserted. I made my template twice that long, folded it over, and taped it to create a more sturdy template to hold up to all the folding! 2. 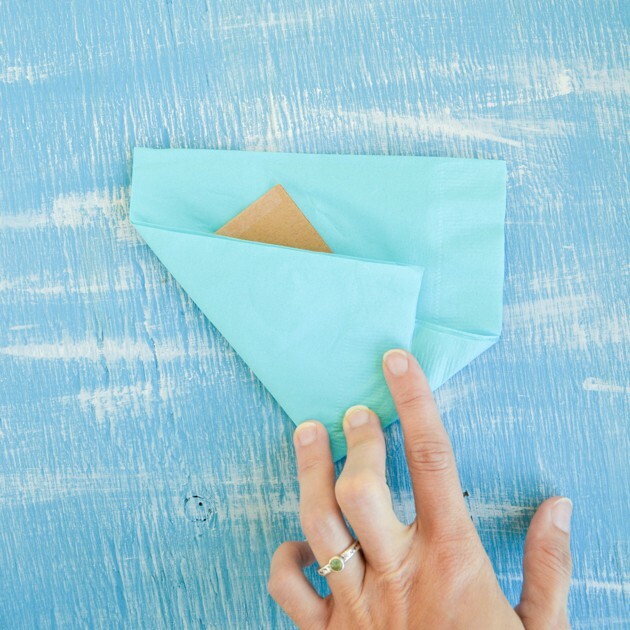 Position your template on a napkin, an inch or two “in” from the corner with all open edges. 3. Fold the bottom corner up, as shown. 4. Fold one edge over. 5. Fold the other edge over, folding the tip under, if needed. 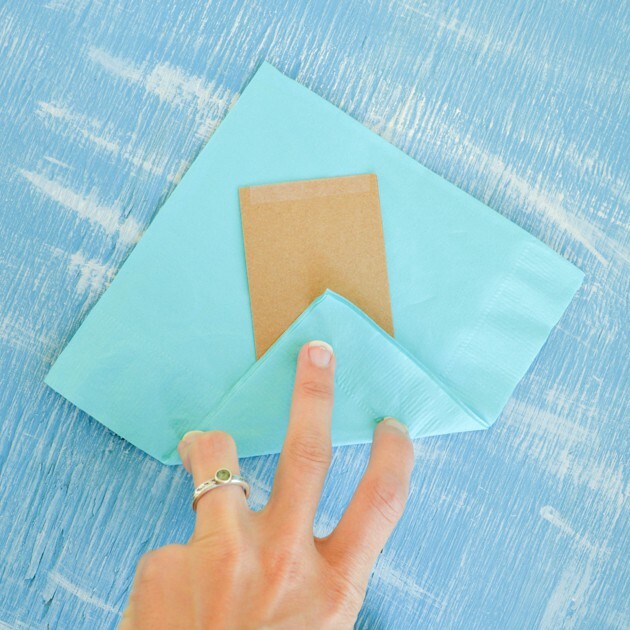 Make sure the fold is straight and crisp, but slightly loose so you can remove the template without tearing the napkin. 6. Insert the flatware behind the cardboard template. 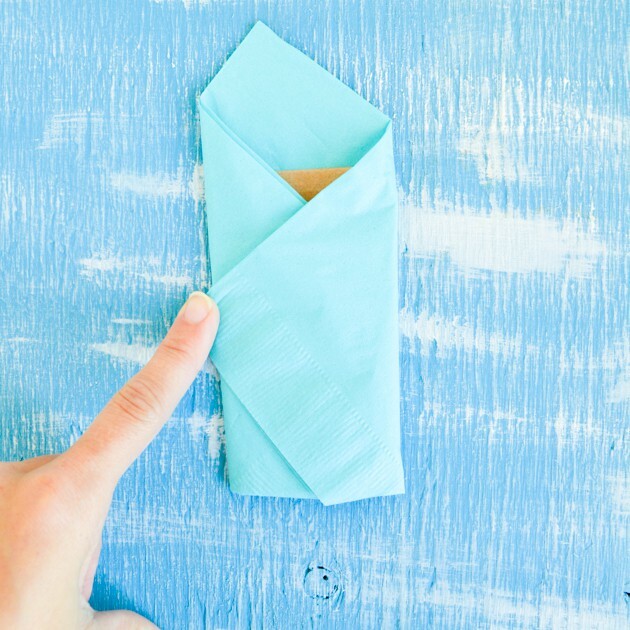 This ensures it is caught in the pocket you just made and doesn’t fall out the bottom of the napkin! 7. 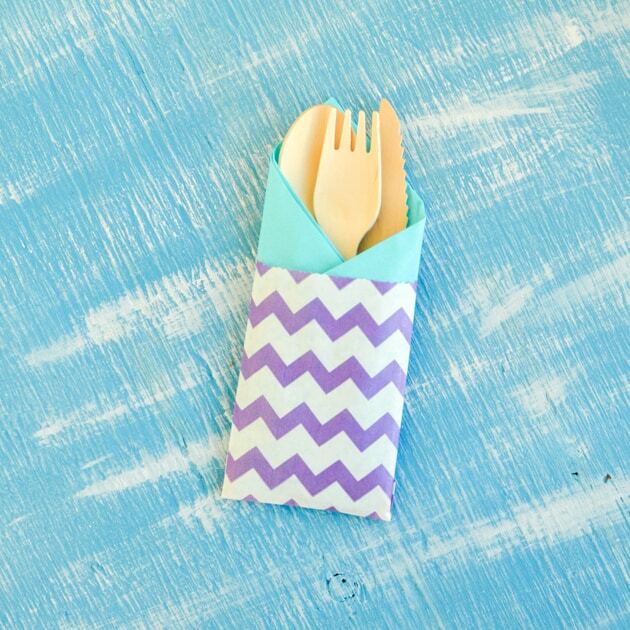 Insert the napkin/flatware combo into a paper treat bag. 8. 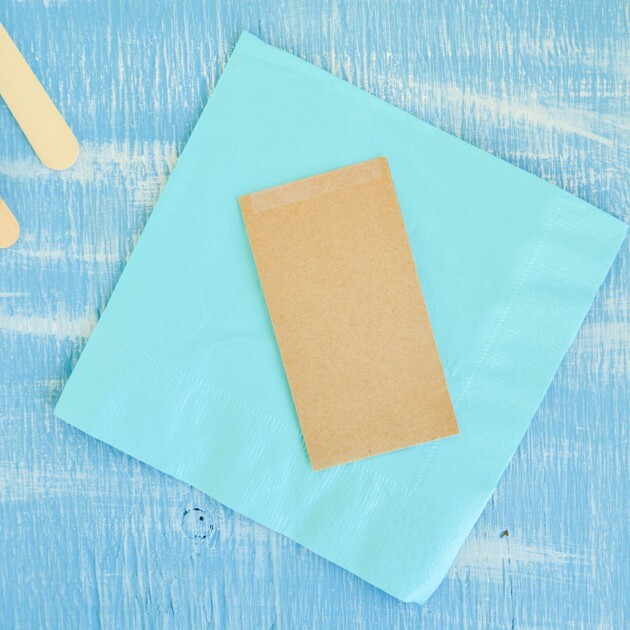 Once everything is firmly seated in the bag, you can carefully remove the cardboard template. 9. 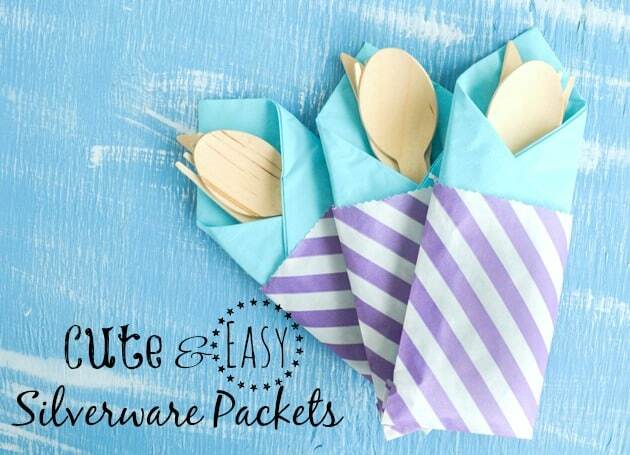 Repeat steps 1-8 as many times as needed and enjoy your cute silverware pouches! I don’t have any pictures of these in action at our reception, but they worked out very well. It was so incredibly windy that any loose napkins would have been in the ocean long before it was time to eat! They’d work well for holiday cookouts, picnics, or just as a fun way to brighten up a lunchbox. 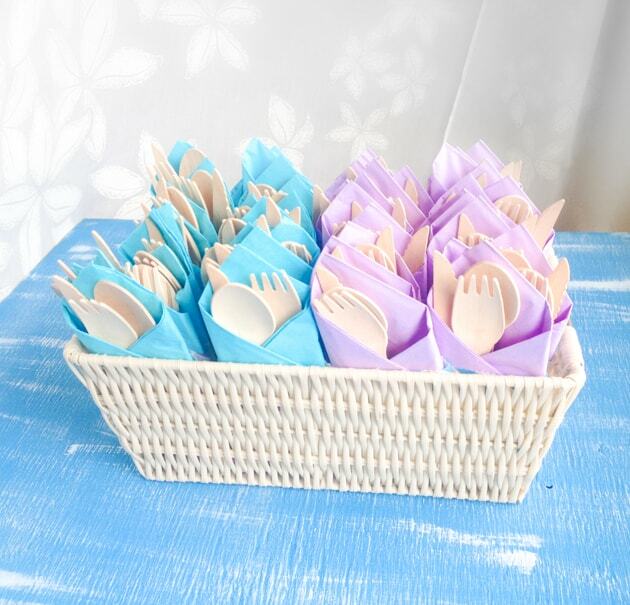 Have you ever parceled flatware up for a function before? Did you do something like this, or take things in a different direction? I am a bit of a germaphobe, too, although having kids has made me get over it a little bit. 🙂 These packets are such a great idea, and they’re adorable, too! Pinning this to try at my next big gathering. It’s totally okay! I think a bit of ‘germaphobia’ is helpful. 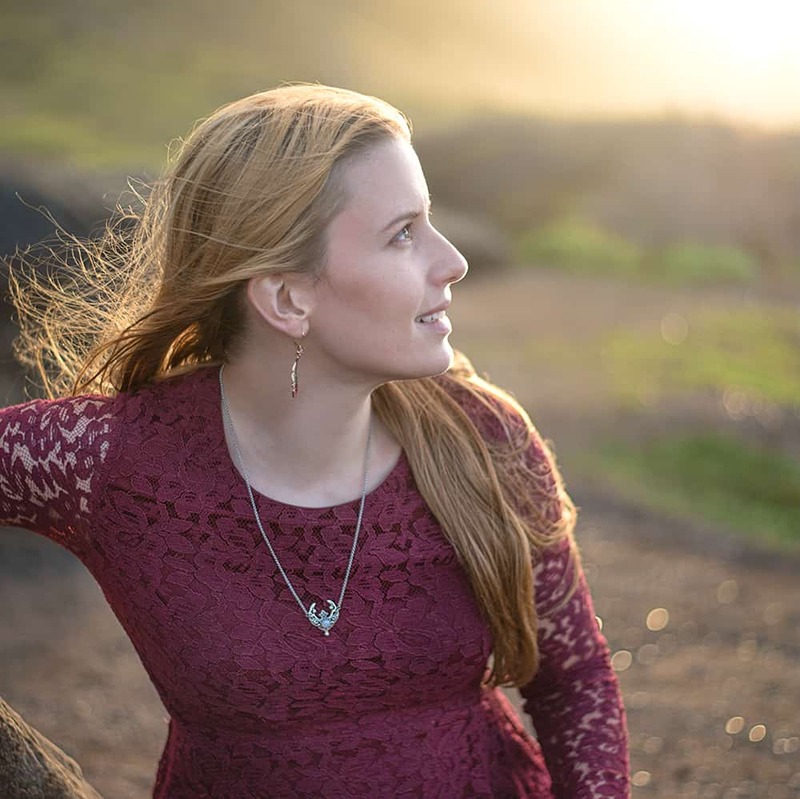 =) Thanks for pinning!